I was browsing pinterest the other day (you know, as you do) and I saw a picture of these little Russian Dolls and I thought, wow, they look familiar. 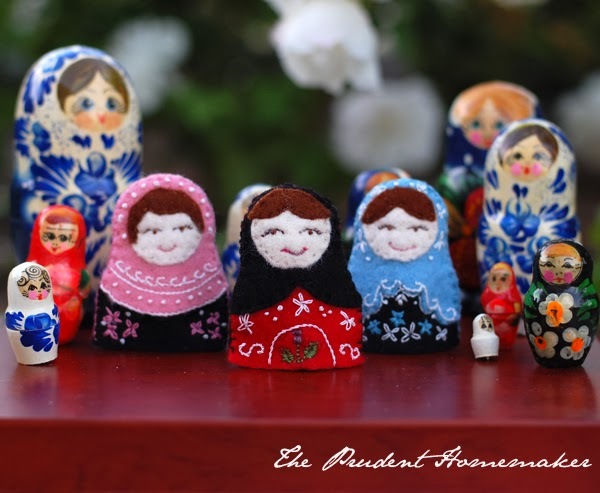 Then I realised that Brandy of The Prudent Homemaker had used my free matryoshka finger puppet pattern that I designed for Sew Mama Sew! Hasn’t she done an amazing job? She’s put in such a lot of work and has created something that I am sure will be passed on through the generations. Drop by her blog to see her suggestions for embroidery stitches of you fancy making something similar. Have you made any finger puppets with the free pattern I made for Sew Mama Sew? If so I’d love to see how you got on!